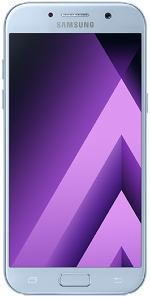 The Samsung Galaxy A5 (2017) has a 5.2-inch Super AMOLED Always On display. 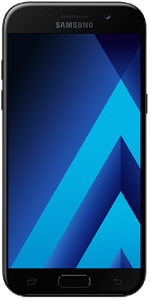 Powering it from within is a 1.9GHz Octa-Core Exynos 7880 processor with 3GB of RAM. There is 32GB native storage and a microSD card slot for up to 256GB memory expansion. The device can take photos with its 16MP rear-facing camera, record 1080p HD videos, or shoot selfies from another 16MP camera in front. It includes a 3,000 mAh non-removable battery, IP68 certification, NFC, and a fingerprint sensor. Upon release, the phone runs on Android 6.0.1 Marshmallow OS. The device is available in Black Sky, Blue Mist, Gold Sand, and Peach Cloud color options.